Lapidary Whisperer: Colorful Moss and a Mossy Surprise! Colorful Moss and a Mossy Surprise! As my regular readers know, I love listening to the stories the rocks tell me! If you're looking for a category of rocks that are especially chatty, you can't beat those we call "mossy". There are others that love to tell stories, including rhyolite and dendritic rocks, and they're close behind. But nothing beats the storytelling talent of a mossy rock. You may have noticed I consider mossy rocks and dendritic ones to be different items although some people use the terms interchangeably. For details about how they differ, see my previous blog post "Thanksgiving with Dendrites." movie where Westley and Buttercup fight their way through the Fire Swamp while trying to evade capture. As a bit of an aside, their major danger there was "rodents of unusual size" and now there is actually a documentary movie about huge swamp rats (nutria) infesting Louisiana titled Rodents of Unusual Size, check it out on IMDB. Like the cab above, I've had the good fortune to work with some beautiful colorful ones from around the world, even if I don't always know where they came from. 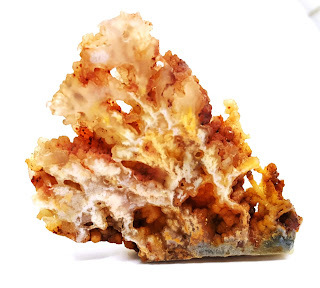 At the lapidary shop where I go every week, they'll often ask where I found a particular rock, and they're getting to expect my answer to be along the lines of "Tucson" or "the show last weekend" instead of some prospecting site. 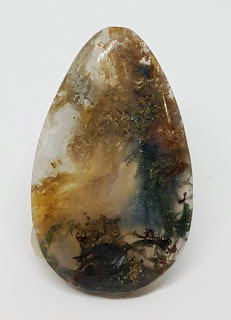 This delightful mossy agate is keeping its secrets so far, When it finally tells me what it wants to look like, I'm all in! This cab is made from fully-enclosed moss in a clear quartz matrix and I'm pretty sure I know where it's from. 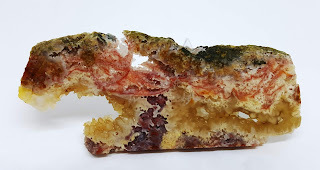 This is from a slab of Regency Rose Graveyard Point Agate from the Owyhee Mountains in Oregon. 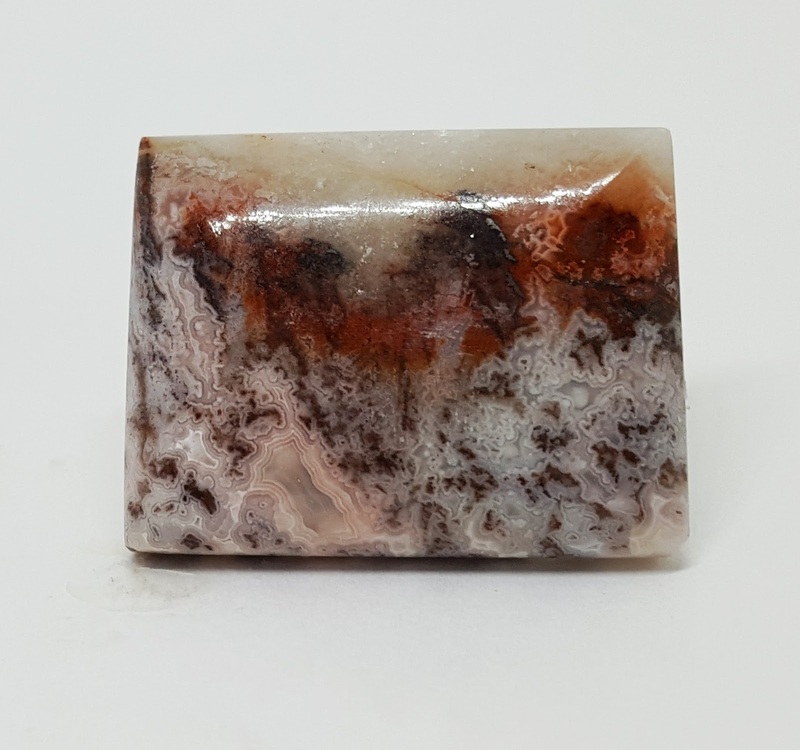 This one told me it felt like fire and smoke and that's the story I tried to show when I made this cab. 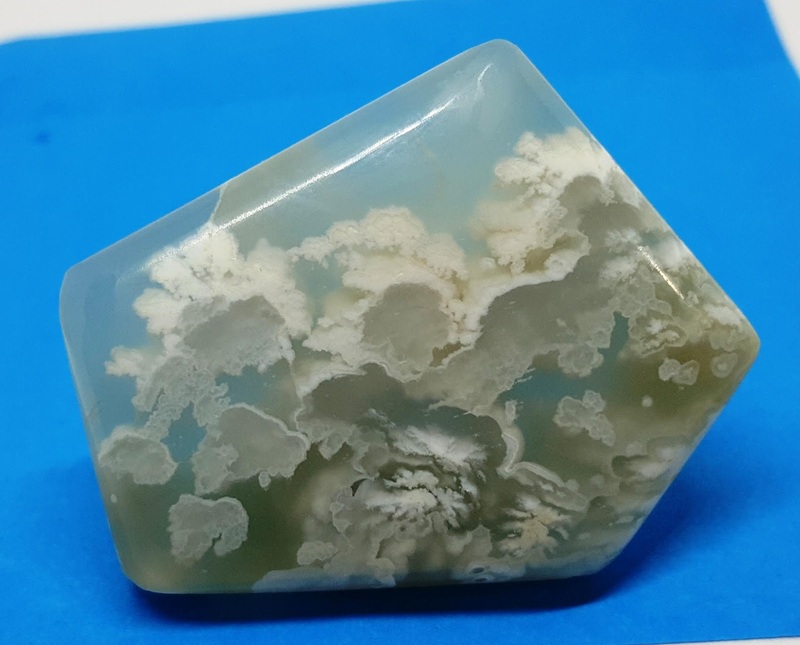 This is very different kind of mossy agate. This one has a name I'd never have guessed from looking at it. 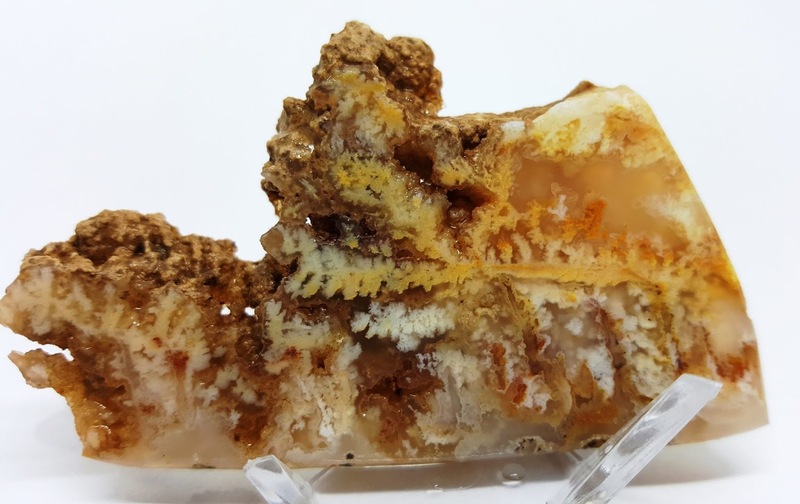 It's Stinking Water Plume Agate! That name would seem to fit better on the "Fire Swamp" at the top. This material has a delightful snowstorm story and it hails from Stinking Water Pass in Oregon and I've only seen it available at a show once. Grab it if you see some. It makes the most beautiful winter-scene cabs! SURPRISE! MOSS OUTSIDE THE ROCK! I cut this bubbly beauty off the edge of a piece of Regency Red Ghost Graveyard Plume Agate. The way this happens is the plumes actually form first and then over time they are surrounded by agate. In my experience, many pieces can be sliced and often take a wonderful polish if they are solid enough. This one seems to be showing me a wildfire with strong winds. Or, it could just be that I live in Northern California and this has been a horrific year for wildfires. What do you see? This whole slab is less than four inches long. I love the imaginary mouth complete with quartz crystal teeth and the red lines. The lines themselves are only about as thick as a sewing thread, and they have teeny-tiny quartz crystals coating them like a blanket. I photographed this one wet because the red lines look so fragile and the white bits matrix are nothing more than a collection of bubble-like material, that I'm afraid this one might not make it through the polishing stage, so I'm keeping it as a specimen. Admit it, this one looks like a snail on its way off the page! At less than three inches long, it is one I love to look at. Theoretically, I could cut off the last third to make a cab. The other side has several interesting small vugs lined with biotryoidal quartz, but I'd sure miss my snail! Has a rock told you as story lately? Send me a picture of the rock and the story it told you. Maybe I can use it in a future blog post.